International students – are you thinking about exam results? Are you looking over your results and wishing you had done better? It can feel overwhelming to do your assignments or exams. It can also be discouraging to receive feedback and marks that are not what you’re used to. Remember that it takes time to learn how things work in a different academic environment. Using a second language can also put more stress on you and affect your performance. The good news is you’re not alone, and there is support here at UC for you. The Academic Skills Centre is located on the third floor of the Puaka-James Hight Library. It offers several resources to help you improve your academic results, including online resources. If you need assistance with writing, check out the four-part Introduction to Essay Writing course. You can also book a consultation with a Learning Advisor to review your writing one on one. If you want to practice your speaking and listening skills, come along to the Speaking and Listening for English Language Learners workshops. For assistance dealing with cultural adjustment and transition, anxiety, worry, or stress, staff at the Student Care and UC Health Centre provide wonderful support. It’s ok to ask for help, it’s part of being a successful student. Make sure you don’t miss out on the opportunity to win one of three all-expenses paid internships in Shanghai this summer! Global China Connection (GCC) is working with Fonterra, New Zealand Tourism and Westland Milk to bring you these internships. If working with one of these three companies sounds good to you, visit our website and submit an application! Check out our facebook page or website for more info! Applications close Friday 18 August, 11pm. UC hosted a NCEA Japanese workshop for secondary school students on Thursday 8 June. The workshop was attended by 370 students from 15 schools and was the 5th annual event hosted by the UC Japanese programme with support from the Canterbury Network of Teachers of Japanese. 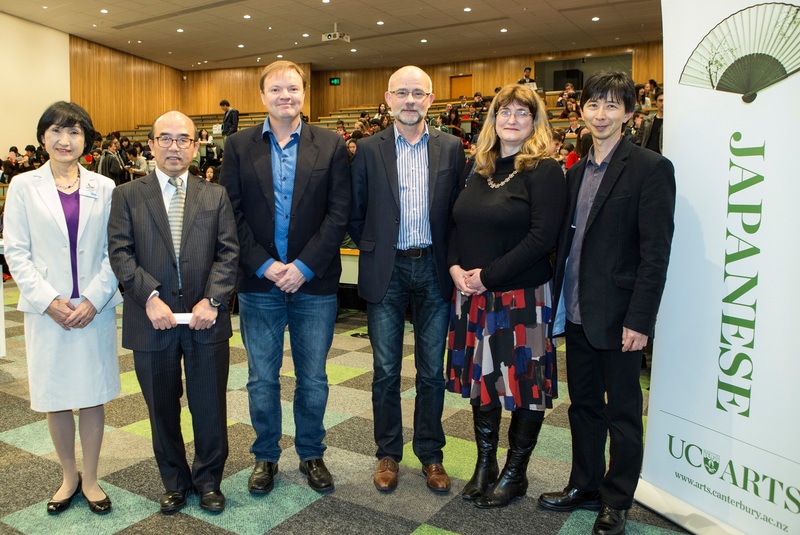 The event attracted the largest number of participants since it began in 2013 and is the largest event of its kind on Japanese language education in New Zealand. The day started with a warm welcome from Professor Paul Millar (Deputy Pro-Vice-Chancellor – College of Arts), and greetings from Mr Mitsuru Murase (Consul, Consular Office of Japan). A special talk was delivered by UC alumni and internet marketing pioneer Mr Tim Williams, on his encounters and experiences in Japan, as well as the skills required for the rapidly changing world. The secondary school students had three intensive language sessions, with 30 UC students who helped them to learn Japanese as role models and mentors. The feedback was overwhelming, indicating those involved enjoyed their day at UC.